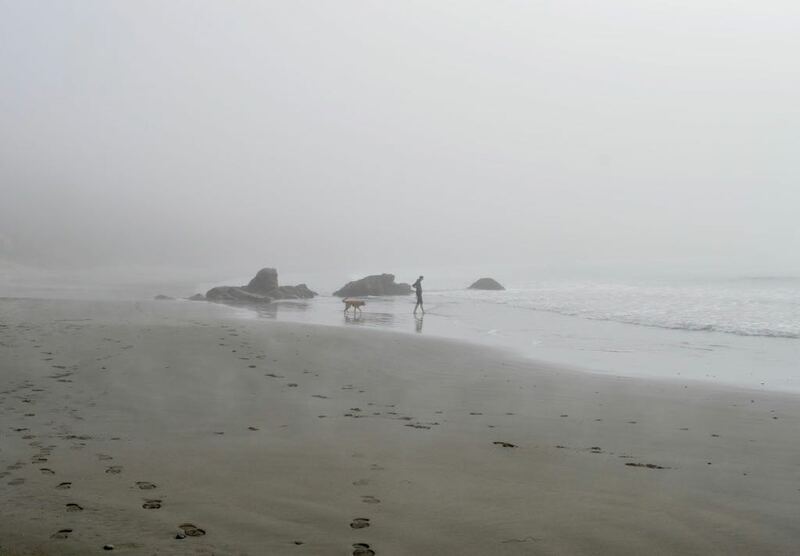 Our goal was to make it to the ocean and spend as much time as possible along the coast. Coming from Calgary, which is landlocked, seems to have resulted in the coast becoming this beacon which is calling to us. 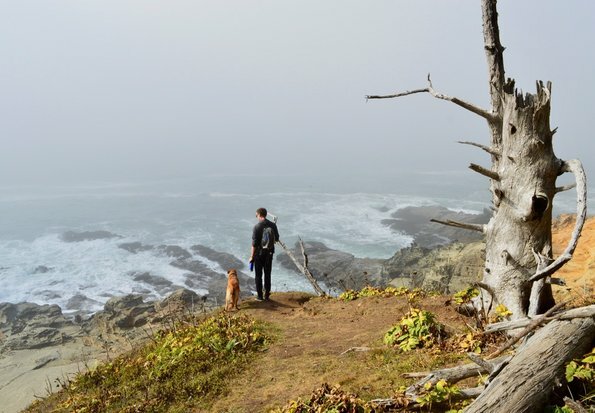 Despite feeling the “pull” of the ocean we did manage to slow down and found some lovely places as we journeyed through Oregon and headed West. Our time in Oregon began with the coldest night of our trip so far. 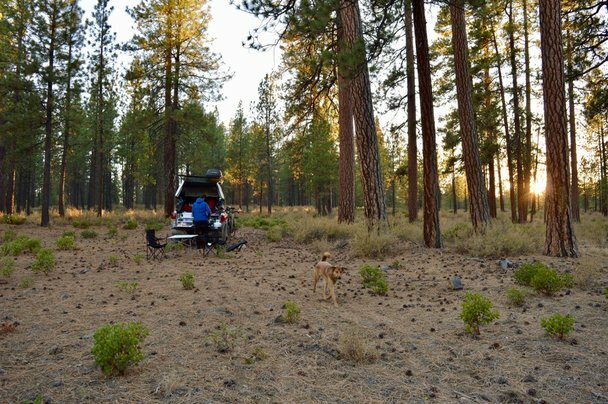 We camped in Malheur National Forest and the temperature was close to -10 Celsius overnight. The evening was also chilly and was made much more enjoyable by having our first campfire of the trip! We found free firewood and decided a little extra heat was needed to make our outdoor living setup more liveable. Overnight we didn’t put up our back window refletix (extra insulation) as we wanted to see out and my sleeping bag froze to the window from condensation… fun! We packed up fairly fast and hit the road with the heat turned up. Along with our first campfire we also had another first of the trip. We had our first propane tank fill up! We have a 11-pound tank (shorter than the typical style) as we wanted a shape that could easily and securely fit on our roof rack. We weren’t sure how long the tank would last us given we use it to cook breakfast and dinner on our propane stove top. When we got the tank filled we found out we had only used 8 pounds – not too bad for a week and a half of use! 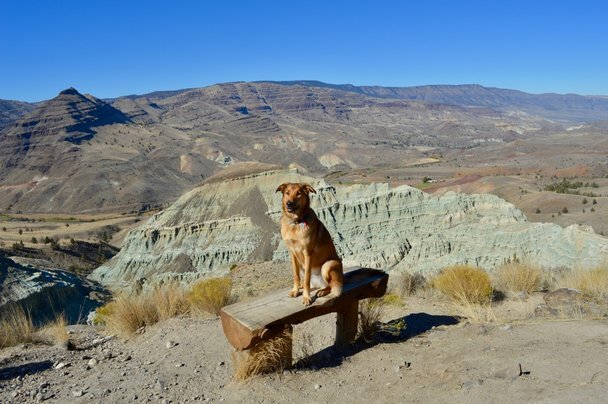 Our next stop in Oregon was the John Day Fossil Beds National Monument. This area is known for its well-preserved layers of fossil plants and mammals. There is still an active paleontology research lab and even a free exhibit which allows you a glimpse of the prehistoric past of Oregon. It was a nice and relatively warm sunny day so we took in the sites with a 5k hike to a scenic overlook. We have been working on Roo’s photo poses (see below). Post hiking at John Day Fossil Beds we continued towards Bend, Oregon. We had heard that it was a great base camp for many outdoor activities and consequently added it to our “visit” list. Along the way we passed by a small village called Mitchell and of course had to stop. Mitchell got to visit Mitchell! Mitchell had a cute main street with eclectic shops and a brewery. The brewery patio was dog friendly so we spent some extra time in Mitchell, sipping refreshing beer and cider while enjoying the sun. On our way to Bend we ended up staying in National Forest land near Sisters which is just outside of Bend. Sisters had a great outdoorsy vibe and we felt right at home! A highlight was the Sisters Bakery, we had the most amazing cheddar, garlic and chive scone. It literally melted in your mouth and both Mitchell and I agreed that scone was on a completely new level and the bar for all future scones has been set very high. Both Sisters and Bend are very close to National Forest land and free camping. There is also a huge number of fantastic mountain bike trails. We spent two days in this area exploring and biking. While I would yet to consider myself an avid mountain biker, it is growing on me, I particularly enjoy green trails that don’t have too much of an incline. I am not a fan of biking hills. Roo on the other hand seems to be a fan of all things biking. She loves to run alongside the bikes and it seems like she would go forever. In Bend we learnt that while Roo seems to have endless energy and wants to keep running alongside the bike that is probably not in her best interest, and needs to be somewhat moderated. There was one really great loop trail that Roo did twice (it was a fun trail!) and she seemed very happy and just exhausted at the end. Mitchell and I packed her into the truck thinking having a tired pup would mean she would sleep nicely while we went to explore the Old Mill District in Bend, which is a shopping and river walk area. This is where Roo’s extra morning exercise must have caught up with her because as we were pulling into the parking lot she barfed all over the back of the truck. We now have evidence that she does in fact simply inhale much of her food without chewing, as a significant amount came back up in full kibble form… The good news is when you’re traveling with all of your worldly possessions you have some basic cleaning supplies on hand! We did end up buying some carpet cleaner which seemed to help and as I write this it’s a few days later and I think the smell has finally faded! Or have we have simply gotten used to it? After our adventures in Bend we carried on to Crater Lake. Crater Lake National Park did not disappoint. This lake was formed when a volcano collapsed thus creating the look of a crater. One fact we found interesting is there are no rivers flowing into or out of the lake; the lakes evaporation is compensated for by rain and snowfall. If you get the chance to visit you definitely should! From Crater Lake we headed straight for the coast and Coos Bay. We planned to stay at a campsite right in town and enjoy showers but we were turned away because they only accept fully self-contained rigs and no tents or pop-up campers. Now that we are on the coast there is significantly less public land and it is harder to find a free campsite for the night. We ended up making our way to another campground just outside of town, and although the dry camping site we selected was far removed from the amenities (our site was actually outside of the campground entrance) it worked out fine and we had showers and even got laundry done! We started heading south along the coast and went through many port towns and beaches. We ended up staying at a great campground on Flores Lake. They had awesome free Wi-Fi and we met some fellow travellers who are also doing the Pan-American highway. It was great to be able to exchange information and discuss the ins and outs of travel and life on the road. We are looking forward to meeting more people on the same route as we continue to head South! 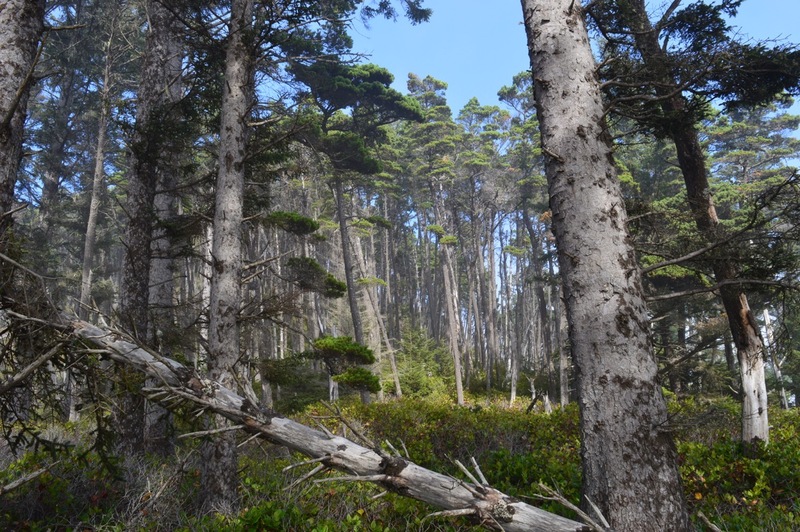 Our time in Oregon was wrapped up with a hike on the Oregon Coast Trail. We enjoyed everything about Oregon and will definitely be back to explore more of it one day. Glad you enjoyed Oregon and many of the places we explore every year. 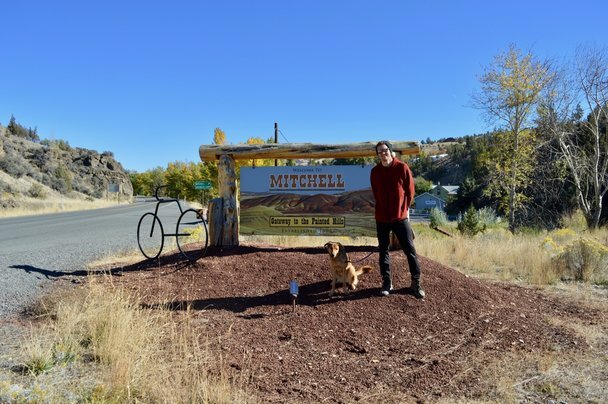 We stopped in Mitchell in October to explore that neat little town, on our way to Sisters to visit daughter Crystal & ex-wife Judy that lives there. 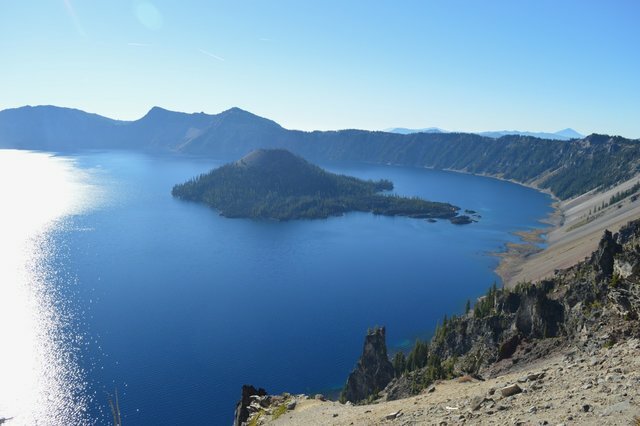 We live a little over 2 hours from Crater Lake, so it’s a frequent stop that beckons. Probably not a future destination, but we accept pop-up campers if you need a free space. The Steens Mountains in the SE corner of Oregon is out of the way, but definitely a destination to consider. It has spectacular scenery, wildlife, camping and hot springs. Hi Dennis, thank you for the comment! We did really enjoy Oregon and will definitely be back at some point, I’ll have to make a note of the Steens Mountain’s! Appreciate the offer for a space to camp!